They say tastes differ, and that’s true. Favourite food for each of us is dishes we love. One More Beer & Wine Bar’s menu is a combination of offers to cater each and everyone. “Cuisine for me is a laboratory of tastes, textures and colours. I consider it as an experiment, a possibility to create something new based on what the Nature provides us with in various parts of the world”, says Sergei Dushkov, the chef of the bar. He uses only high quality natural products to satisfaction of even the pickiest customers. For example, for the beer, vorschmack is served in rice chips, fish-n-chips are accompanied with a sauce made of sweet chili, lime juice and grated green apple. Framed in this sour-sweet mix the dish really acquires a richer and brighter flavour. The wine is enjoyable with a refreshing kohlrabi and bok choy salad in teriyaki and lime sauce or calamari and tomato salad. The main dishes are cooked in a smoker, or grilled: flounder and trout, beef burgers and lamb loins. The one page menu contains three important chapters – Main Dishes, Beer and Wine. The wine list offers up to 80 wines in glasses and bottles - from France, Italy, Spain, South Africa, America, Russia and Georgia. The caring staff is always there to help the guests to make their choice. There are 23 sorts of draft beer and a great selection of bottled one. The customers can also savour craft beer from various breweries of the world. One More Beer & Wine Bar is an artistic menu offer in combination with artfully designed interior which creates a warm and cozy atmosphere for its guests. 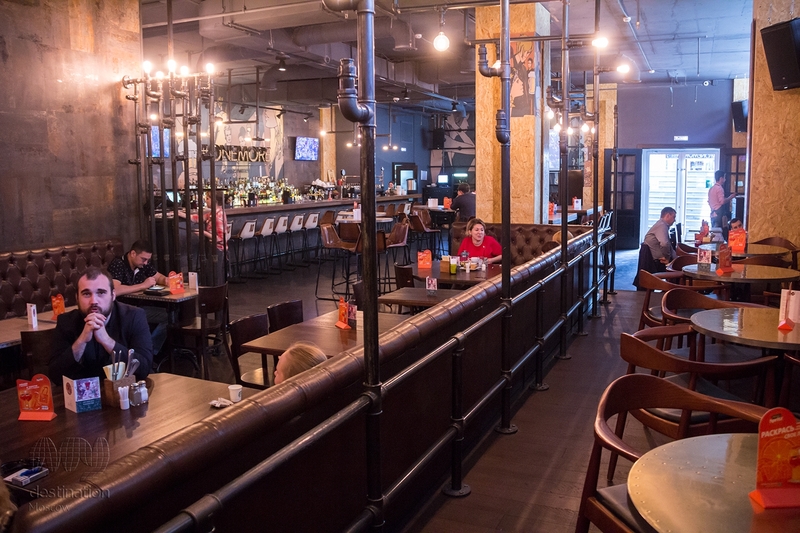 The dark walls and metallic frames and constructions in the industrial style, high round tables with baseball-glove-like chairs, leather couches for longer lasting get-togethers and, surely, TV screens to enjoy music videos and sport broadcasts - the designers masterfully managed to merge an industrial pub and a sophisticated wine bar into a coherent whole. The central wall painting behind the bar counter conveys the image of uniting of two worlds – the beer male character and the wine female one. The time for business lunches is from 12 to 4 PM. Non-alcoholic beverages (200 ml) are included in the cost. Fridays and Saturdays are featured with dancing. There’s free Wi-Fi. Car parking is available. The new place - One More Beer & Wine Bar in Zemlyanoi Val - is for those who love good wine, nice beer and delicious food well-matching for the purpose.